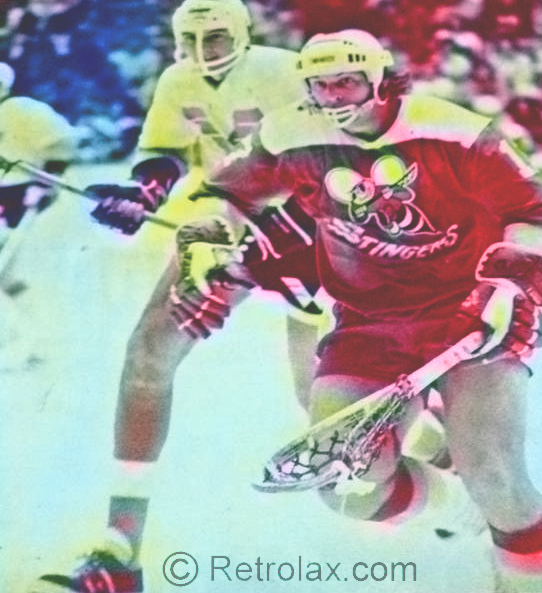 1974 NLL Draft and we were off to our teams to play professional lacrosse. Training camps opened and with great enthusiasm we would play our game for money. We were young, talented and almost all of us had played for noting each summer so even the thought of a Professional league sent us dreaming and when we actually made the team and arrived in the cities around the league we took this challenge, this opportunity seriously and got down to business as the select group we were. Some left jobs, perhaps not yet careers, some married and some with children took this leap of faith because playing lacrosse in the summer is what we had always done. Opponents became teammates, friendships are sustained even today as we in places have had reunions. We were playing lacrosse for a relatively small amount of money but when we had played for nothing before this was a big deal and a fulfilment of a dream so to speak. 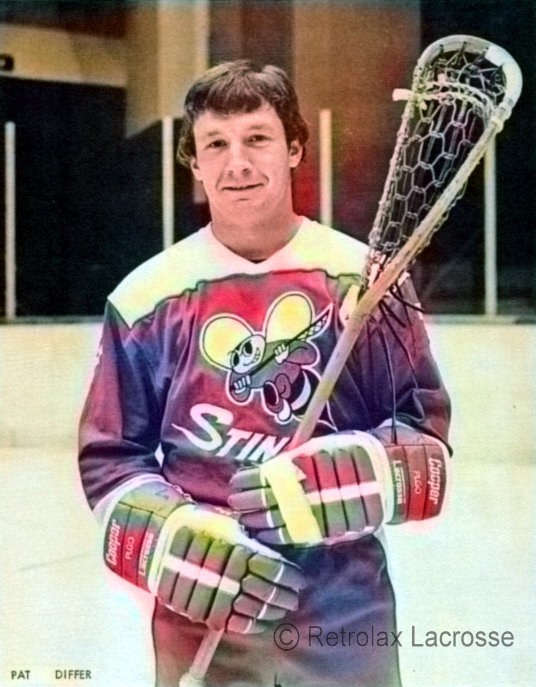 The Syracuse Stingers line up was solid, as was the case across the league. 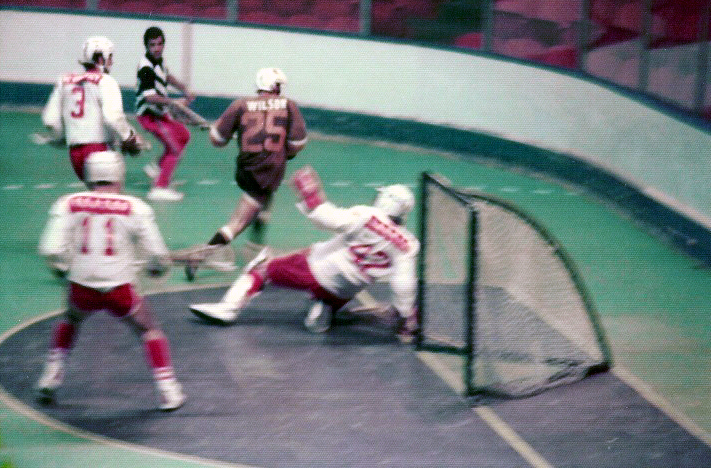 A 40 game schedule was really almost two seasons of lacrosse anywhere we had been before as most schedules in box lacrosse east and West were not much over 20 games. All teams had things to work through off the floor, the league had assembled the officials, schedules were in place and as players we just wanted to play, not aware or at all even concerned about structure or planning we were like a herd of cattle following instructions to practice, travel and play lacrosse. 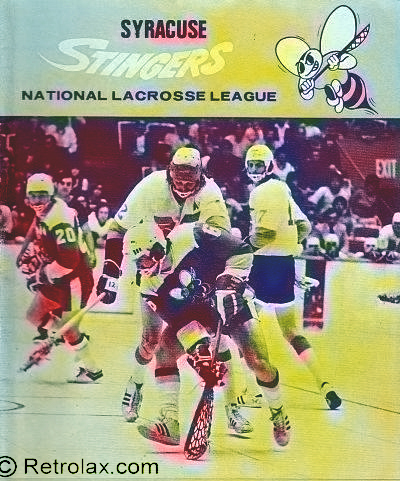 The Stingers began the 1974 season in a tragic manner win/loss wise. It was a slow death as far as hope of making the playoffs. All these years later it is still a painful memory. Coaching issues, close games from the start of the season May 15. Our first game was just down the road in Rochester May 17. All fired up we were ready to play, lost 26-21 and our season began. It is customary in sport to analyze a game just completed for good and bad. Losing this first one scoring 21 goals was a bit of a signal, allowing 26 was too many in any league. We continued through May and into June over the first 11 games 0-10 -1 managing only a tie against Rochester June 5th. Our first win came June 12 vs Philadelphia at home in Syracuse. Many things happen to a team when on a run like that, everything is questioned. The first few losses were by relatively big scores, followed by 3 one goal losses which really felt tough. Close but…. Players came and went and Medo Martinello was brought in to coach, we immediately at that point began to play with more of a system and reached respectability, still were not good and finished the season in last place 12 wins 27 losses and the 1 tie. Our season was over as playoffs began. What made the season even longer was the fact that after that start we really were in such a deep hole any playoff hopes were a very long shot and we became spoilers early in this first professional season. The news came over the 74/75 winter that we were off to Quebec City. There was another draft as more players made the decision to play in the NLL. The league would be stronger in theory as more talent from all over would stock teams. Chris Rudge who was a player in Syracuse has become the Director of Player Personnel and would conduct the draft for the Quebec Caribous as the new owners were depending on this draft and other moves to strengthen the team and everyone involved were still smarting from the previous season in Syracuse. I clearly remember a phone call from Chris before the 75 draft. He called to ask a question. “You played out West, so you know the players out there. 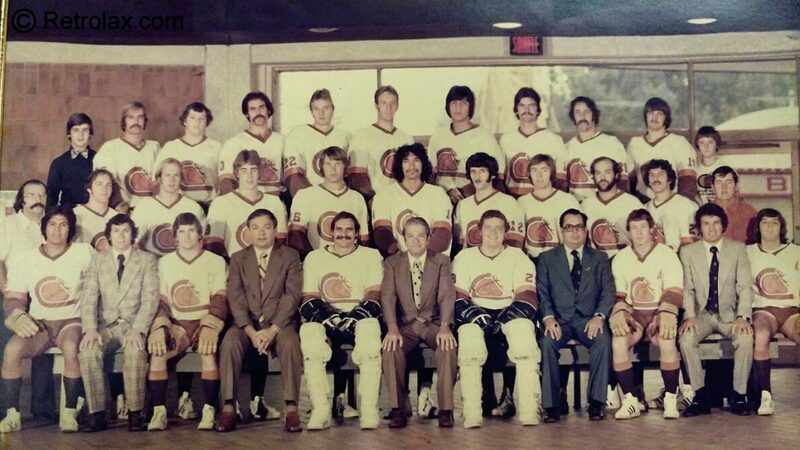 (I had in fact played in 73 in Vancouver for the Burrards after coming out of Junior in Ontario after the 72 season) Who would you take Lewthwaite or Durante with the first pick?” which we had after finishing painfully last in 74. DURANTE 10 times out of 10 was my answer. 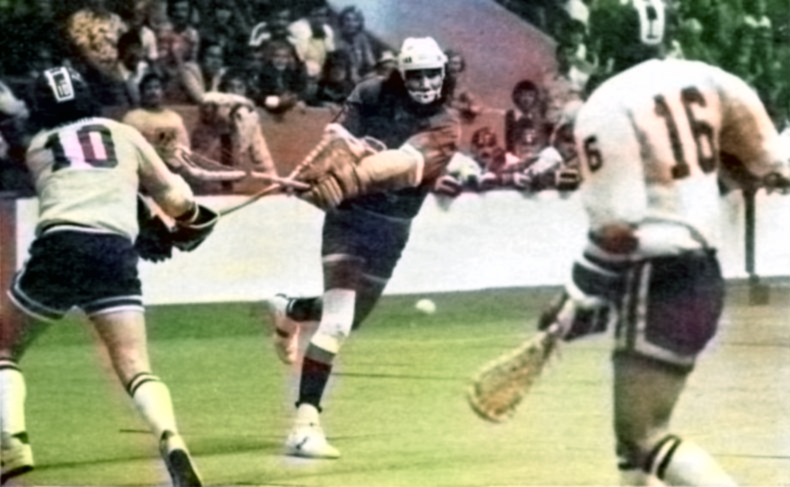 It was a different era of lacrosse, this Pro league was a run and gun Eastern style of lacrosse, all aspects of the game were important. Really, there was no one bigger, meaner or tougher than Lewthwaite in the WLA at the time, and it was a legitimate question. WE needed Durante who was younger faster and more versatile. More of an offensive threat was my logic having played against both of them. Chris asked if I was sure as he was making this pick without seeing either one of them. 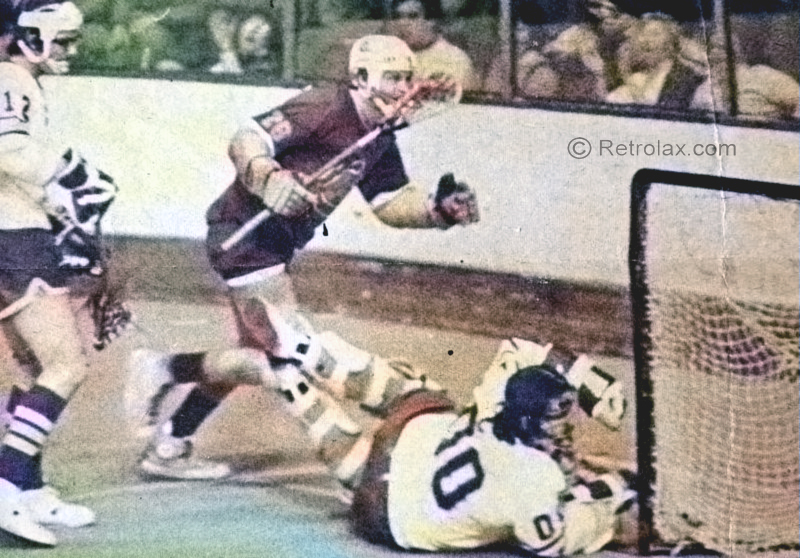 Dave Durante in 75 was our leading scorer, League All Star and a huge all round boost to our team structure. Our training camp was in Drummondville Quebec in March which wasn’t quite the North Pole but you could see it from there. We had a “Superstars Competition” in camp to add some flavour to the on floor practices. We ran the streets, swam in the pool Art Seekamp from Long Island was like a torpedo in the pool, the rest of us just watched as he must have set some kind of record, man could he swim! We lifted weights and played other games to create a oneness that carried on over into the season as it opened in the Colisee. The home of Beliveau. 14,124 pack the place for our home opener vs Boston, capacity was 10,500. We lost! Here we go again….must have been in some heads. We brought in players such as Brian Evans, Murray Cawker, Jim Miller and through trades as the season wore on Jim Gow, Gord Osinchuck, Rick Bisson and Brian Wilson. This influx of new blood changed the culture and attitude. We were in the hunt all season which was a big difference. Ups and downs happen in any season. This one was 48 games and things standing wise were tight. The very best team all season long was Long Island coached by Morley Kells as they finished well ahead of second place Montreal. Going over the game results in the stats package once again two or three teams as season end approached could have been in or out with just a win or loss here or there. Examining the final standings shows Quebec finished 4th in the final playoff spot only two points out of second place and tied with Boston who had a winning record against Quebec there by earning them 3rd. Closer examination of game results shows that Philadelphia, finalists the year before, lost their final 8 games making it the case that all three playoff teams were the beneficiaries. WE WERE IN! In 1975 for Quebec to play Montreal in anything playing in the same league was a big deal. Horseshoes, handball anything would be part of a Battle for Quebec. Quebec had a rich history in the AHL with Beliveau, in Junior hockey with Lafleur and the Remparts but, Montreal had the Habs and took Beliveau. The match ups were set Quebec in 4th would play 1st place Long Island Tomahawks and Montreal would face off against Boston. I really must mention one incident from the series we had vs Long Island. We won the series in six games, tough series, still sore from that one. In game 6 in Quebec at the start of the 3rd period as we came out of our rooms and took our place on the benches, for some reason the announcement was made (in French so we really didn’t know what was going on from the bench as we were in the heat of the battle) that there would be an award handed out on the floor for the “most popular Fan”. 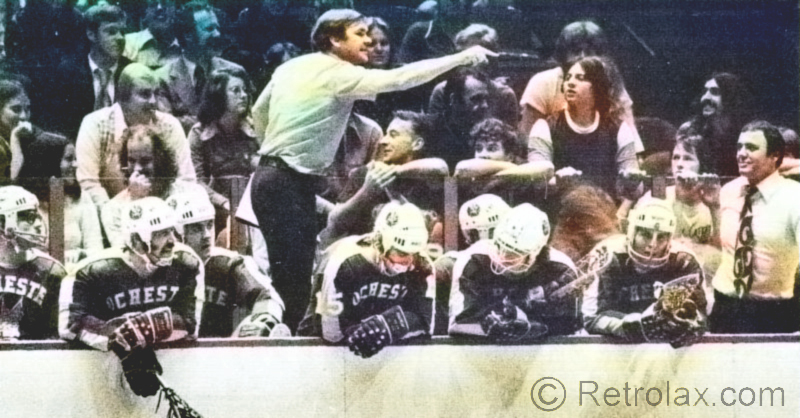 The benches were on opposite sides of the floor in those days in the Colisee, we were looking directly across the floor at the Long Island bench and leading in the series 3 games to 2 and up a few goals in game 6 going into the 3rd period when all this took place. This fellow comes out on the floor from the Long Island side and receives this little trophy from the announcer, the crowd roared, and Morley fumed on the Long Island bench wanting to get back into the game and series. As the crowd cheered this fellow with a T-shirt on, big beard as he received his trophy Morley was actually standing on the top of the boards with his hands on his hips, glaring at this stupidity on the floor (in his mind) and the fan instead of just walking off the floor, went directly in front of Morley and held up the trophy twisting it back and forth (in French) saying “Ne-ah Ne-ah Ne-ah” to Morley’s face. Well……Morley dove off the top of the boards and hit this guy with a full punch and it was on! Rolling around on the floor in a full fist fight wrestling match the crowd went wild. It took a moment for the officials not believing what they were seeing. Blood everywhere, hair messed up, T-shirt ripped, Morley’s tie was up around his head, shirt untucked as they were separated, we sat (as the Tomahawk players too) stunned at what we had just seen. The game finished and we won the series, Montreal had beaten Boston in 6 games and the Dream Final was set. Sports Illustrated called it “A Provincial Affair”. Players on the squad who had been through the whole Syracuse experience in 74 were on the verge of going into the final after playing in a season where we were really out of if after the first 12 games the season before. Montreal was good, sport is about emotion and momentum which we both had plenty of and then add the Quebec thing and it was kind of a big deal. Quebec won the first 3 games as the record shows, Montreal came back to win the next two. Tight games, tough lacrosse as could be expected. Big game performances from both sides. Every loose ball was important. Before a packed house in Quebec, game 6 not wanting to go back to Montreal the Caribous prevailed. Brothers in Arms on both sides shook hands. Shaking Billy Sheehan’s hand I thought back to when we were 9 playing on the same team in the outdoor box in Long Branch. We sat drained in the dressing room, almost too tired for a moment to celebrate. After accepting the trophy making the customary trip around the floor showing appreciation to the grateful fans, we had beaten Montreal! And the odds having come from worst to first. Lasting memories that were wonderfully renewed in 2017 in Toronto at a Rock game where the Team graciously agreed to honour the 1975 Caribous at a game during the 150th Year of Lacrosse celebrations. We are still talking about that weekend.